When the first mass-market electric cars glide onto our streets this year (2011), early adopters will need their mathematical wits about them. With a range of only 100 miles, or less, on a full battery, a day’s pootling about could put you close to empty well before you can reach home for an overnight charge. In London at least, drivers won’t be be so prone to “range anxiety”. This week (February 14, 2011) Transport for London (TfL) signed a deal with international electronics company Siemens to install at least 1300 electric vehicle (EV) charge points across the capital by the end of 2012. The Source London network of charging points is part of the Mayor of London’s drive to make London the EV vehicle capital of Europe. Siemens will manage the operation of the network and registration of drivers. For the first year annual membership of the scheme will cost £100, and charging will then be free at the point of use. Charging points will be installed by over 40 Source London partners. including Sainsburys, Asda, NCP, Capital Shopping Centres, Scottish and Southern Energy and London boroughs. They be found in street, car parks and other public locations. The deal between TfL and Siemens will see Siemens run the Source London back office to March 2014 at no cost to taxpayers. Philip Skipper, Siemens’ director of emobility business and development told me last year (2010) Siemens want to take care of everything beyond the driver’s credit car swipe – all the “back office” functions, such as making sure the right energy supplier is paid as the user moves around – so that all he or she has to do is check the bill at the end of the month. The other part of Siemens’ plan is to integrate electric cars into the “Smart Grid”, in which an intelligent monitoring system would make much more efficient use of available power. “Wherever possible we would take power from renewable sources” said Philip Skipper. And those sources could be very local — for example solar panels on the roof of the canopy over charging points, or a nearby energy from waste plant. 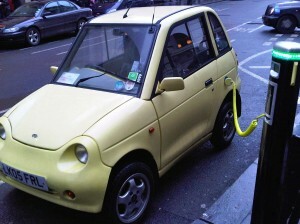 EVs would double as mobile energy storage units when they were not being used, taking surplus power, for example generated by solar panels or wind turbines, then feeding it back (provided the driver didn’t need it) at times of peak demand, using the same charging units and cables.